The first two rounds set the pattern of the fight. Pacquiao pressured Broner and Broner retreated and played defense. Not much happened in those round but Pacquiao activity and landed a couple of more punches won those rounds. Broner managed to land a hard right and left hook to begin the fourth round but Pacquiao kept coming forward while he connected with a straight let and a right hand. Broner landed on one big right as the bell sounded to end the round. It wasn’t until the seventh round that Pacquiao actually hurt Broner and forced him on the rope and throughout the eighth round, he continues to stalk Broner, who threw little back. In the ninth round, Broner started out with throwing combinations and was winning the round when he got nailed by a straight left hand that sent him reeling across the ring. The last three rounds were that of Pac Man stalking and moving forward with little regard for Broner’s power and Broner playing the survival game. Pacquiao won an easy decision and in my view, easier decision than what the judges gave him credit for as the judges had the fight 116-112, 116-112 and 117-111. Pacquiao still had much of the old quickness but he missed a lot of jabs but then Broner simply retreated in a shell. In his career, Broner has been a good fighter but not a great fighter and when he faced pressure fighters, he had difficulty including Marcos Maidana and Jesse Vargas. He never been able to use his boxing skills against pressure fighters and when he step in class like with Mikey Garcia or Shawn Porter, he lost. Broner demonstrated once again his inability to use all his skills and simply retreat in a defensive shell. Pacquiao showed that at the age of 40, he can beat a good Welterweight but does he have the skills left to beat Errol Spence or Terrance Crawford? I don’t believe so. The other factor is how serious is the eye injury suffered in the fight as Pacquiao was checked out for a detached retina which is a potentially career ending injury. The initial reports is the retina is not detached but further examination will be required. 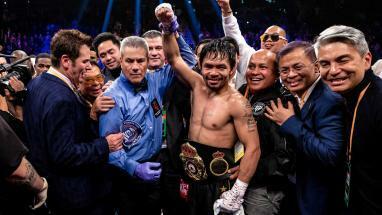 Pacquiao is not the fighter of a decade ago but he is still a very good fighter capable of beating everyone but maybe the elites of the Welterweight division. Nice fight recap. Pac looked very sharp for a 40 yr old man. Hopefully the eye injury isn’t too severe! Manny Pacquiao at 40 can still fight in a very high level fight but it seems that he lost some steps compared when he was at his prime. He has been on so many battles and there might be side effects to his body. Maybe he can still have two to three fights but he needs to be more careful and smarter. We all know that at 40, boxer is already on the decline stage. He has nothing to prove because he was already a legend and he was once the face of the boxing. After a couple of fights maybe retirement is the best course of action.